The rapid transformation in telecommunications industry has resulted in rapid transformation of the ecosystem. Communication Service Providers (CSPs) are working aggressively to either build new networks or enhance existing ones to support new technologies and growing end user demands. As CSPs rush to deliver differentiated service offerings, they face numerous challenges in an effort to provide high quality and experience on the new service while ensuring that the existing offerings are not impacted. Test automation is a key enabler for this requirement which can help minimize guess work and human error and at the same free up resources to focus on scenarios that require manual intervention. Automation testing is defined as developing and executing tests that can run unattendent, comparing the actual to expected result. Automated Testing is automating the manual testing process currently in use. 60 hrs that means 5 testers full 12 hrs implies saving in both time and cost. Analyzer testing is nothing but to test different recorded trace files of the network parameters of different interfaces and protocols. 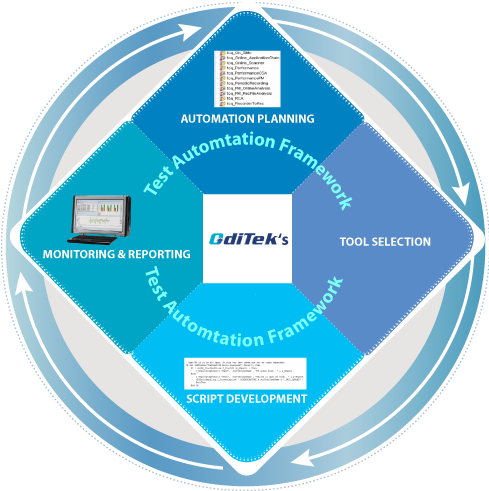 153 hr of Manual Test Execution can be achieved by 25 hr (15hr test execution+10hr report analysis) by Automation Test Execution . Very much helpful in running C&S regression test. Automation is really helpful to run regression test cases before hotfix delivery and saves lot of time . System release RC builds are done once in a week and includes several correction . Its impossible to identify impacted areas and test those .